Out of every ten people, seven can not live their faith in full freedom. In 21 of the 194 countries studied, there is hardly any religious freedom. The report notes that there are two types of religious persecution: one by policy and one by members of other religions. 79% of all abortions in New York City over a 10-yr period – 726,845 babies – were Black and Hispanic. The number of aborted blacks, according to the Centers for Disease Control, outnumbers the next leading 7 causes of death among blacks combined. Blacks are down to 12.3% of the U.S. population in 2010, from 14.8% in 2000. According to Dr. La Verne Tolbert, former NYC Planned Parenthood board member, Planned Parenthood targets black babies, and there have been 20 million aborted Black babies in the U.S. since 1973.
and to obtain for us the graces and favors we request. Saints, where nothing defiled can enter. Editor’s note: Computer users should quickly understand that we weren’t the first to utilize the concept of a “firewall” in order to avoid sabotage or corruption. If Jesus’ human flesh had been tainted by sin in any way, then his life and his sacrificial death would have been pointless, and we would all still be trapped in our sins, hopelessly destined for an eternity in hell. Mary is God’s original “firewall” against human sin. Superabundantly graced by God … Mary … even from the moment of her conception … was preserved from all sin (original and otherwise) and as a result of God’s grace (and Mary’s willing cooperation) she never sinned at all … before, during, or after Jesus Christ took on the holy flesh that Mary agreed to provide … flesh that was absolutely necessary for Christ’s mission of reconciliation and redemption. 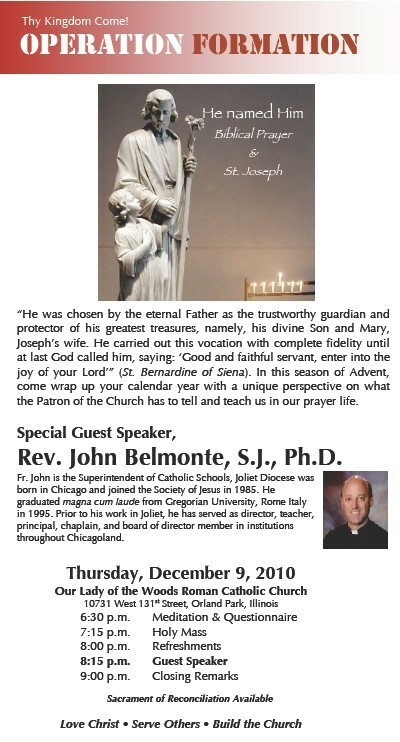 A recurring them in Christian chat rooms and other types of on-line forums is the Catholic understanding of saintly intercession … especially regarding the role of the Blessed Virgin Mary … and whether such practices can be truly termed Christian. It’s true that a good number of today’s Catholics and non-Catholics alike, seem to have a great deal of difficulty correlating the literal text of the Bible with Catholic teachings and practices, on this matter. And while most Protestants choose to concentrate solely on faith, scripture, and Jesus … Catholics may choose all of the above … plus the very substantial “cult” of Mary … along with veneration of angels and all the other saints. So … who is right … and why? From Adam’s fall until the Immaculate Conception of the Blessed Virgin Mary, the world was totally devoid of God’s sanctifying grace, with all of mankind enslaved to Satan, sin and death. In the fullness of time, God provided, through his sovereign power over all creation, the Blessed Virgin Mary, who was conceived without sin … “full of grace” … “highly favored” … the only non-divine person ever proved to be totally immune to the corruption of Satan’s evil, earthly dominion. with or without the help of God’s grace. Luke 1:46-49 And Mary said: My soul doth magnify the Lord. And my spirit hath rejoiced in God my Saviour. Because he hath regarded the humility of his handmaid: for behold from henceforth all generations shall call me blessed. Because he that is mighty hath done great things to me: and holy is his name. The fact that Mary chose to so closely cooperate with God in all of Jesus’ great, salvific work, is absolute proof of the sufficiency of God’s grace … that his will be done, on Earth, and in Heaven. makes her THE “Model Christian” of all time. 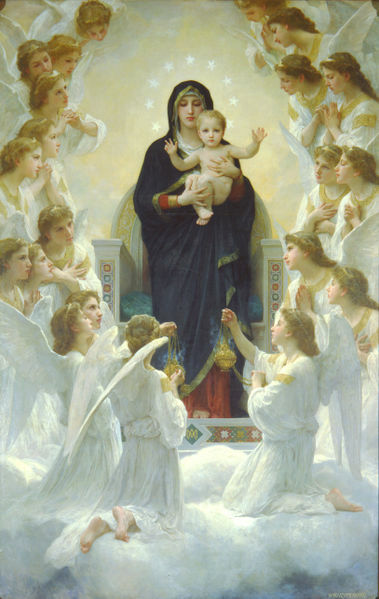 God’s grace is also why the Blessed Virgin Mary holds so many titles … including the “Mother of the Church” … and why she has already been crowned the authentic “Queen of Heaven” … ruling and reigning there, at the right hand of her divine son, Jesus … according to the “amazing” power of his grace. That is not to say there will be nothing left in Heaven for the rest of us, since God’s abundance is infinite, and he never “runs out” of anything. So we can be sure of receiving all that God has promised us in Heaven, no matter how many billions of other souls might triumphantly enter therein. While Mary, the Mother of God, enjoys a totally unique and preeminent position in God’s order of grace, there’s nothing preventing God from giving awesome power and authority to angels and/or to all the other saints. Revelation 2:11 He that hath an ear, let him hear what the Spirit saith to the churches: He that shall overcome shall not be hurt by the second death. Revelation 2:26 And he that shall overcome and keep my words unto the end, I will give him power over the nations. Revelation 3:5 He that shall overcome shall thus be clothed in white garments: and I will not blot out his name out of the book of life. And I will confess his name before my Father and before his angels. Revelation 3:12 He that shall overcome, I will make him a pillar in the temple of my God: and he shall go out no more. And I will write upon him the name of my God and the name of the city of my God, the new Jerusalem, which cometh down out of heaven from my God, and my new name. Revelation 3:21 To him that shall overcome, I will give to sit with me in my throne: as I also have overcome and am set down with my Father in his throne. Revelation 21:7 He that shall overcome shall possess these things. And I will be his God: and he shall be my son. The power of God’s grace is the only thing that makes all of this possible. Luke 1:37 Because no word shall be impossible with God. to ask Mary and the saints for help? Because Mary and the saints are already “tried and true” … holy and acceptable to God. 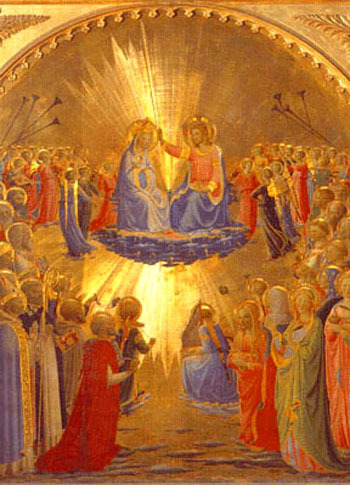 Because only God and his grace made the triumph of Mary and the saints possible. Because the promises of Christ are practical and salvific, and meant to be an ongoing blessing to all the People of God, wherever they might presently be found. Because we’re all “family” … related to each other (and to God) through Adam, Jesus Christ, and the Church … and there is solid biblical precedent for the right of “kin” helping (and redeeming) other “kin”. Because helping others in their time of need is the charitable and Christian thing to do … especially for those who have already been perfected by God’s grace, in Heaven. Because God respects the dignity of the human race, which he created (in his own image and likeness) by kindly remembering to include us (along with our good works/voluntary cooperation with his grace) in his universal plan of salvation. Because God loves us, and Heaven poses no barrier at all to the power of divine love and grace. to assist men, in times of need. and to come to the knowledge of his truth. Islam needs to emerge from its’ self-imposed “dark ages” and join the world community. and the Crusades are behind us. Islam claims to be a religion of peace, but so long as Islam continues to harbor terrorists and murderers within its’ ranks, and so long as Islam appears to officially support various types of revenge and brutal discrimination, under the false guise of Sharia and Jihad, few non-Muslims are ever likely to take Islam seriously, as a true world religion … let alone, a religion of peace. Muslim Sharia Law is an only slightly modified version of the old Mosaic Law of the Jews. The Law actually worked pretty well in the harsh living environment of nomadic desert dwellers … and it should have … since it was originally given to the Israelites by God (Allah) for that express purpose. But when impressed on modern-day urban citizenry by certain fundamentalist Imams, Sharia can easily take on the look and feel of brute totalitarianism. All of current-day Islam’s inherent violence and its’ serious denials/abuses of personal freedom make Islam look very unappealing and even frightening to the common man. And that should not come as a surprise, to anyone. I’m betting that the promoters of true Islam can make a logical case for many/most of their fundamental beliefs and practices, but there’s no way they can ever do the same for violent Jihad and brutal, religious persecution and discrimination … simply because that type of behavior is essentially an unjust, corrupt aberration … and it was never a part of original, authentic Islam. 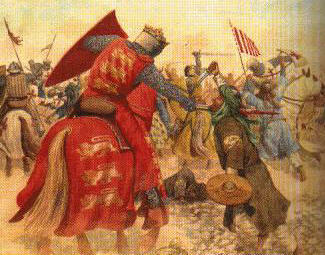 The days of the Crusades are behind us. The world (except apparently, for certain Muslims, and a few others) has moved on. Now, it’s high time for the true leaders of the Islamic world to get together, universally reject violence and terrorism, disown and shun those who can’t or won’t change their Medieval ways, and finally, join the modern family of nations, in peace. The above citations were taken from Denziger’s, and were compiled by Bob Sungenis, at Catholic Apologetics International. Jesus personally gave us the new commandment: Love God. Love your neighbor. In this, he was anticipating his perfect and atoning sacrifice, which would accomplish what no law ever could. The old law …. all of it … ceased to exist once Jesus gave us the NEW and BETTER covenant in his blood. Under the NEW COVENANT, we have the BEATITUDES, which do indeed promise BLESSINGS and REWARDS for laudable behavior. The Beatitudes are to the new covenant what the law was to the old … only better. So that begs the question: Which laws are you following? Precisely how does following an obsolete set of laws obtain grace? Why are you not instead seeking ALL the blessings and rewards promised by Christ, in the Beatitudes? Jesus went on to found the authentic Church, to serve as the infallible guide for every generation of Christians, until the end of time … and to act definitively, as the primary distributor of all his grace, peace, and forgiveness. The church eventually readopted and readapted the Ten Commandments … to be used as a guide to the spiritual realities and Christian morality of the New Covenant. But the fact remains: People continue to sin almost constantly, and the law provides no remedy for sin, other than judgment. It never did. Fortunately for us … God does. God saves by the grace of the cross, which is freely available to all … primarily through the one, holy, apostolic and universal church that Jesus personally founded, for the purpose of our salvation … the Catholic Church – not by any law. Gal 3:1 O senseless Galatians, who hath bewitched you that you should not obey the truth: before whose eyes Jesus Christ hath been set forth, crucified among you? Gal 3:2 This only would I learn of you: Did you receive the Spirit by the works of the law or by the hearing of faith? Gal 3:3 Are you so foolish that, whereas you began in the Spirit, you would now be made perfect by the flesh? Gal 3:4 Have you suffered so great things in vain? If it be yet in vain. Gal 3:5 He therefore who giveth to you the Spirit and worketh miracles among you: doth he do it by the works of the law or by the hearing of the faith? Gal 3:6 As it is written: Abraham believed God: and it was reputed to him unto justice. Gal 3:7 Know ye, therefore, that they who are of faith, the same are the children of Abraham. Gal 3:8 And the scripture, foreseeing that God justifieth the Gentiles by faith, told unto Abraham before: In thee shall all nations be blessed. Gal 3:9 Therefore, they that are of faith shall be blessed with faithful Abraham. Gal 3:10 For as many as are of the works of the law are under a curse. For it is written: Cursed is every one that abideth, not in all things which are written in the book of the law to do them. Gal 3:11 But that in the law no man is justified with God, it is manifest: because the just man liveth by faith. Gal 3:12 But the law is not of faith: but he that doth those things shall live in them. Gal 3:13 Christ hath redeemed us from the curse of the law, being made a curse for us (for it is written: Cursed is every one that hangeth on a tree). Gal 3:14 That the blessing of Abraham might come on the Gentiles through Christ Jesus: that we may receive the promise of the Spirit by faith. Gal 3:15 Brethren (I speak after the manner of man), yet a man’s testament, if it be confirmed, no man despiseth nor addeth to it. Gal 3:16 To Abraham were the promises made and to his seed. He saith not: And to his seeds as of many. But as of one: And to thy seed, which is Christ. Gal 3:17 Now this I say: that the testament which was confirmed by God, the law which was made after four hundred and thirty years doth not disannul, to make the promise of no effect. Gal 3:18 For if the inheritance be of the law, it is no more of promise. But God gave it to Abraham by promise. Gal 3:19 Why then was the law? It was set because of transgressions, until the seed should come to whom he made the promise, being ordained by angels in the hand of a mediator. Gal 3:20 Now a mediator is not of one: but God is one. Gal 3:21 Was the law then against the promises of God: God forbid! For if there had been a law given which could give life, verily justice should have been by the law. Gal 3:22 But the scripture hath concluded all under sin, that the promise, by the faith of Jesus Christ, might be given to them that believe. Gal 3:23 But before the faith came, we were kept under the law shut up, unto that faith which was to be revealed. Gal 3:24 Wherefore the law was our pedagogue in Christ: that we might be justified by faith. Gal 3:25 But after the faith is come, we are no longer under a pedagogue. Gal 3:26 For you are all the children of God, by faith in Christ Jesus. Gal 3:27 For as many of you as have been baptized in Christ have put on Christ. Gal 3:28 There is neither Jew nor Greek: there is neither bond nor free: there is neither male nor female. For you are all one in Christ Jesus. Gal 3:29 And if you be Christ’s, then are you the seed of Abraham, heirs according to the promise. Col 2:7 Rooted and built up in him and confirmed in the faith, as also you have learned: abounding in him in thanksgiving. Col 2:8 Beware lest any man cheat you by philosophy and vain deceit: according to the tradition of men according to the elements of the world and not according to Christ. Col 2:9 For in him dwelleth all the fulness of the Godhead corporeally. Col 2:10 And you are filled in him, who is the head of all principality and power. Col 2:11 In whom also you are circumcised with circumcision not made by hand in despoiling of the body of the flesh: but in the circumcision of Christ. Col 2:12 Buried with him in baptism: in whom also you are risen again by the faith of the operation of God who hath raised him up from the dead. Col 2:14 Blotting out the handwriting of the decree that was against us, which was contrary to us. And he hath taken the same out of the way, fastening it to the cross. Col 2:15 And despoiling the principalities and powers, he hath exposed them confidently in open shew, triumphing over them in himself. Col 2:17 Which are a shadow of things to come: but the body is of Christ. Col 2:19 And not holding the head, from which the whole body, by joints and bands, being supplied with nourishment and compacted, groweth into the increase of God. Col 2:20 If then you be dead with Christ from the elements of this world, why do you yet decree as though living in the world? Col 2:21 Touch not: taste not: handle not. Col 2:22 Which all are unto destruction by the very use, according to the precepts and doctrines of men. Col 2:23 Which things have indeed a shew of wisdom in superstition and humility, and not sparing the body; not in any honour to the filling of the flesh.